Special Piping Materials OSEA 2016 stand. 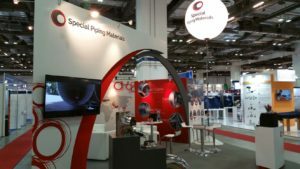 In November Special Piping Materials had the chance to attend and exhibit at OSEA 2016 in Singapore which is the most established Oil and Gas industry event with over 18,000 attendees that visited over the four days. Here at Special Piping materials we had the pleasure of being able to exhibit at OSEA 2016 with our stunning exhibition designed by Numagoo Ltd. Our exhibition presented and expressed our company in a unique and different way to the rest, incorporating the style of our brand logo in the structure of the stand. It was an extremely successful four days at OSEA 2016 as exhibitors and high level executives mingled and addressed the immediate concerns within the oil and gas industry and what we can do to resolve the problems for the foreseeable future.